Just as you probably don’t enjoy spending much time outside when it is stifling hot and the humidity is high, your pet likely doesn’t either. Dogs are sensitive to heat just like humans and can suffer from overheating or heat stroke. Taking steps to protect your dog and ensure they have plenty of opportunities to stay cool can make summer more enjoyable for both of you. Access to water. As you’re filling up your water bottle, make sure to have plenty of water for your furry friend as well. Bring some water and a dish for your dog so they can also take a break and rehydrate. It’s a good idea to leave a fresh bowl of water both inside for your pet, as well as one outside when they’re spending time outdoors. It can also be beneficial to let your dog splash in the sprinkler or lounge in a kiddie pool with a small amount of water. But remember, not all dogs are great swimmers, so if your dog is around a large pool, make sure you’re there too, and that they’re wearing a flotation device if needed. A fresh trim. While you want to avoid shaving your dog too short, a summer trim can help to get rid of any matting and loose fur. However, fur actually helps to protect dogs’ skin from the sun and plays a role in temperature regulation, so don’t go too short. Limit time outdoors. Just like human should avoid the hottest parts of the day, so should dogs. If you decide to go on a walk, make sure there are grassy areas or gravel for your dog to walk on and plenty of shady spots. The pads of their feet are tough yet sensitive and can burn on hot asphalt. A good rule of thumb is if you can’t comfortably keep the palm of your hand flat on the ground for 5-7 seconds, it’s too hot for your dog’s feet. Try to save longer walks for earlier in the morning or later in the evening when it’s cooler. Keep it cool. Make sure your dog has access to air-conditioned rooms in your house, or areas where there is good circulation between fans and windows. Dogs will often vary between laying on hardwood, carpet, tile, blankets, or bedding depending on the temperature and how they feel. Leave them at home. Your dog may love a good car ride, but if you need to make stops where they can’t come inside, leave them at home. The temperature in your car can quickly rise even with the windows cracked and become dangerously hot for your dog. Even if it’s in the 70s outside, inside the car it can feel like the 90s or 100s. Never leave your dog alone in a parked car. Recognize signs of overheating. 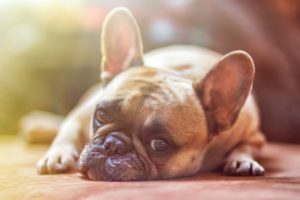 If your dog has trouble walking, seems weak, has difficulty breathing, is panting excessively, starts seizing, or has vomiting or diarrhea, these can all be signs of overheating. Take your pet to the vet immediately so they can be properly evaluated and treated. Remember that dogs with short muzzles often have more trouble breathing and panting already and may be at greater risk for heat stroke. Ensure your pet is safe, comfortable, and well hydrated in the summer heat. If you’re concerned about them being home alone, especially when it’s very hot outside, sign them up for doggie daycare at Lake Wylie Pet Resort. Your dog will have the opportunity to play and socialize while staying cool and being carefully looked after. If you have to go out of town, even just for a night, consider boarding your dog so you know they’ll stay safe and have plenty of access to water and a cool place to relax. Contact Lake Wylie Pet Resort for more information about boarding, grooming, or doggie day care.